Top: Reduced roadway width allows improvements for pedestrians and bicyclists. Class 2 bicycle lanes are located on both sides of the street. A mulit-use path flows in a rustic landscape adjacent to Mills College. Bottom: A series of community work shops provided critical planning and design insight. MacArthur Boulevard from High Street to Seminary Avenue has been a long-standing concern of neighboring residents and users of the corridor because of poor function, access, and safety. 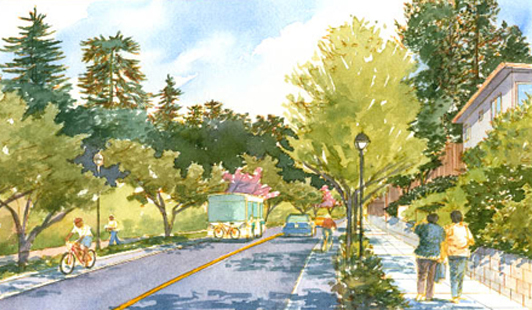 The Laurel Access to Mills, Maxwell Park, and Seminary (LAMMPS) concept plan is a community-based multi-modal transportation plan that offers solutions to these concerns based on discussions with the community and technical studies of the corridor. Initiated by community activism, the concept plan is the product of an active community engagement process in which residents, community leaders, and business owners provided information and insight on a wide variety of issues. The concept plan recommends a balance of transportation modes along MacArthur Boulevard with streetscape aesthetics that reflect and support the residential, business, and college development existing along the corridor. Funding was provided by a Community-Based Transportation Planning Grant from Caltrans and a local match from the city. Prime consultant: Kimley-Horn and Associates, Inc.
Bottom: Existing conditions along the corridor favor vehicles over pedestrians and bicyclists. Bottom: Field investigations with the community and city staff identified issues and opportunities.